← Quito: Is it malaria? If pictures are really worth a thousand words, this is going to be one of the longest posts ever. Just a warning. 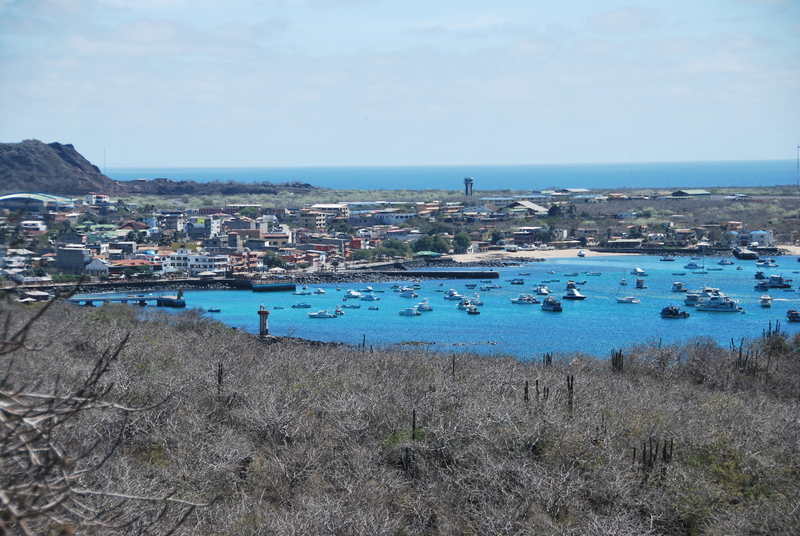 It was no easy feat to get to the island of San Cristobal in the Galapagos. First, we took a cab from our hostel to the airport in Quito, then we flew for 3 hours to the island of Santa Cruz. From there, we took a bus, then a ferry, and another bus to the main port town. Once we got off the bus, we ran to the dock and just barely made the last ferry to San Cristobal. After two hours of bumping through rough seas, we were grateful to be on dry land again, and we were even more excited when we found an amazing apartment to rent for only $30 per night. Just walking down the boardwalk on that first afternoon, the wildlife was everywhere. Sea lions reign supreme in this town. You literally have to go out of your way to avoid them. We played the tourist part well, and we both had the cameras at the ready to try to capture the magic of this place. On our first full day on the island, we decided to take in some of the free sites. 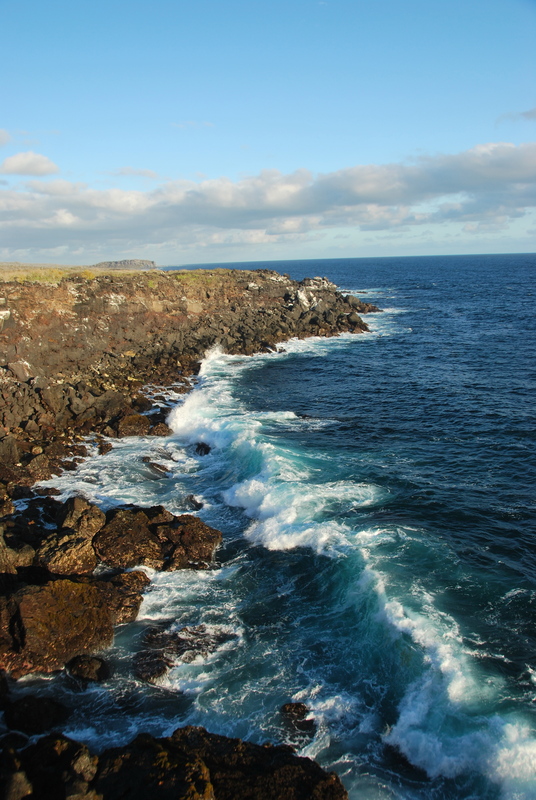 We started at the Interpretation Center (which gave us some nice history and information about the islands), and then we did a nice hike along the coast. It seemed like everywhere we turned, there was something more amazing to see. Lookout - Who knew the water would be so blue? Continuing further down the path over volcanic rocks, our experience turned very Darwin, very quickly. 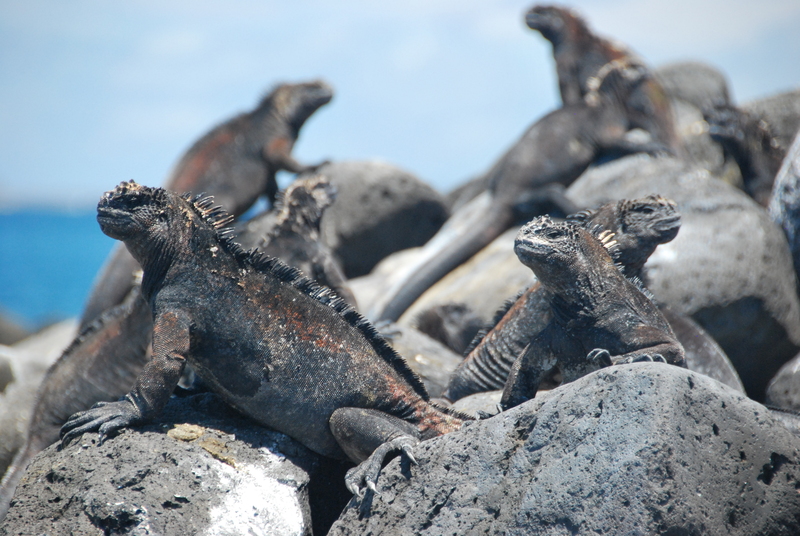 We stumbled upon these marine iguanas sunning themselves after their daily swim in the ocean. 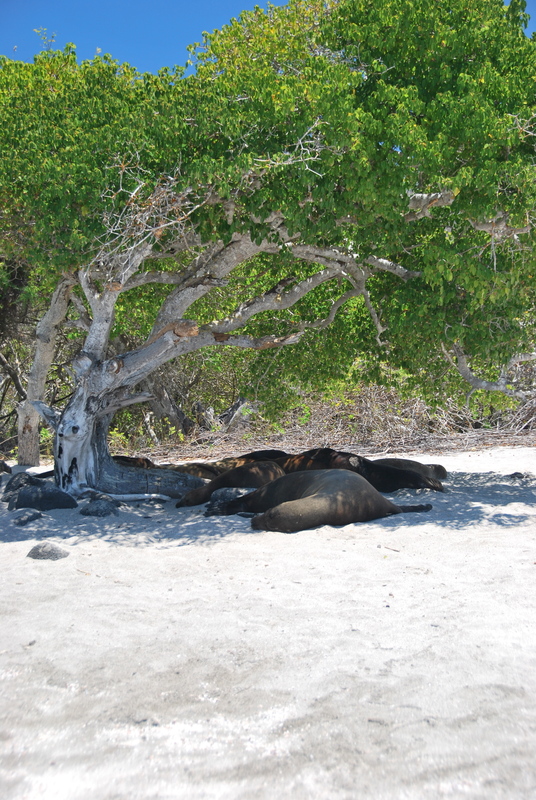 They were very docile and didn’t seem to care much about our presence, just like most animals on these islands. We were amazed at our find, and we felt like true explorers because we found them on our own. We could enjoy watching them without being surrounded by a tour group all jostling for pictures. Little did we know that we would see a lot more of these guys over the next few days. Further down the path we reached a nice little beach with shady trees. We rejoiced at the idea of cooling down in the shade. It looks like we were not the only ones with this idea. We did manage to find a nice little bit of shade (seal lion-free), and we were able to enjoy the water and watch the sea lions play. We also took A LOT of pictures. At one point, Joe had to pry the camera out of Kristen’s hands. 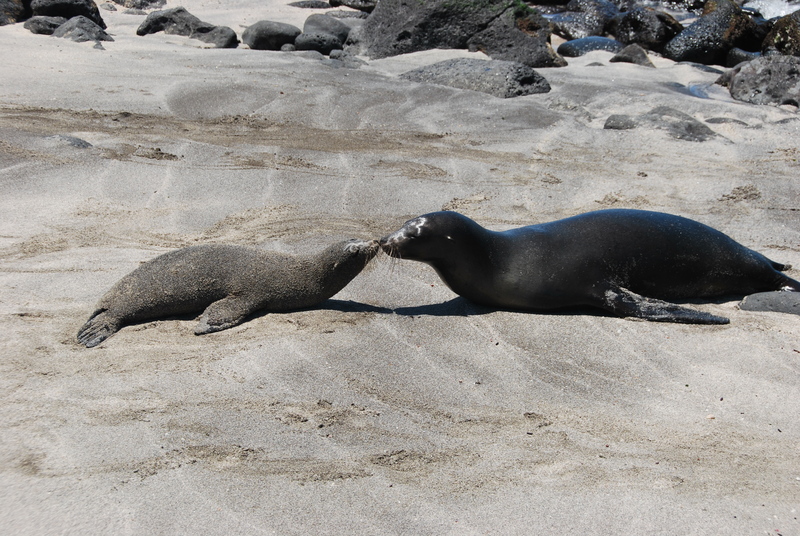 Fun fact: the Galapagos Sea Lions are related to the ones found in California. Supposedly, California sea lions made it down here in an ocean current a long time ago. 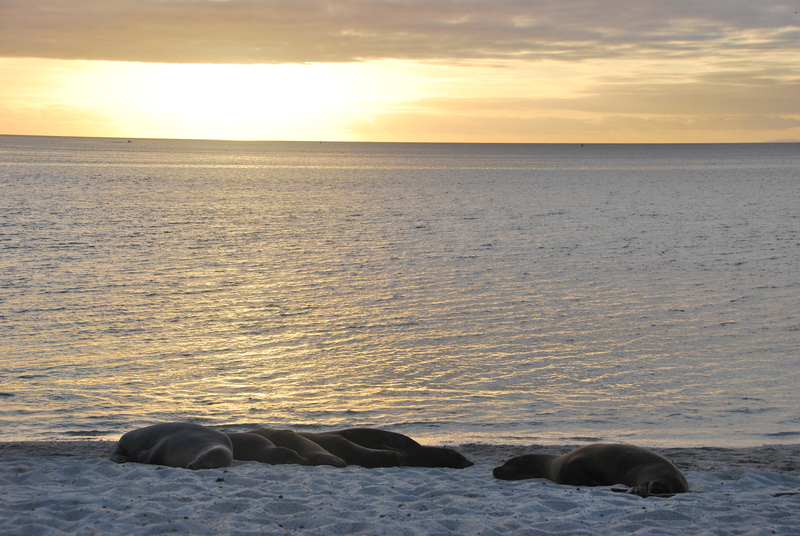 That afternoon, we took a cab to “La Loberia,” a nice beach which was great for viewing sea lions and watching the sunset. We had been sitting on the beach for a little bit, just enjoying the scene, when one of the sea lions started making a lot of noise. 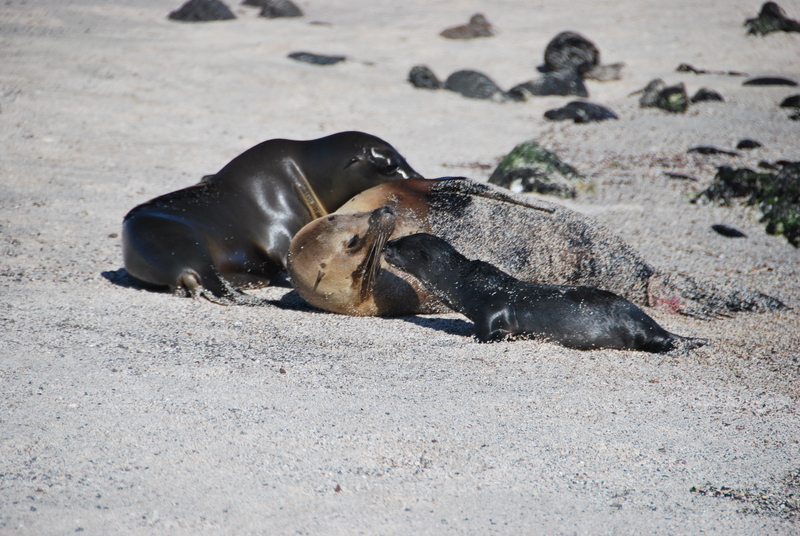 At first we thought nothing of it, but as it continued for some time, we soon realized that a new sea lion was being born! It was an amazing (and slightly scarring) thing to witness. 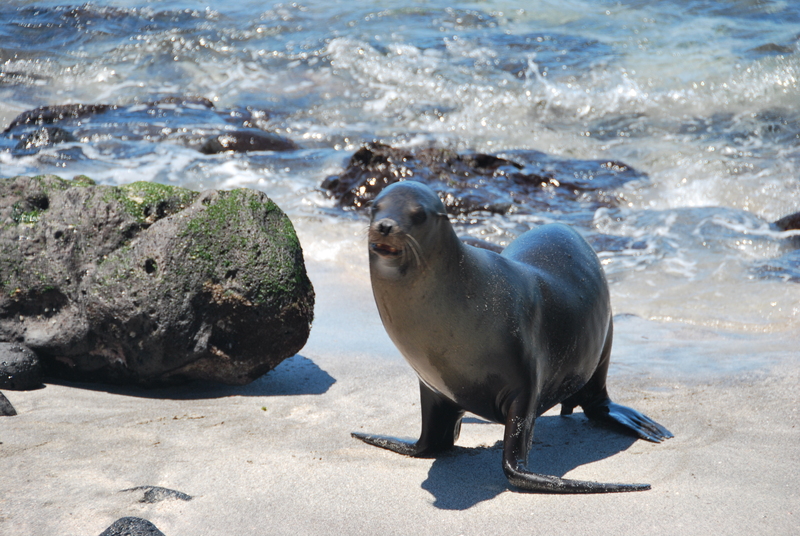 Brand new baby sea lion- take that Carpinteria Seal Sanctuary! After watching the sea lions and their babies for a while, we scrambled through some lava fields to find an unexpected lookout. This was a nice rocky cliff where sea birds lived, and we spent a long time watching them gracefully glide over the water and along the cliff. 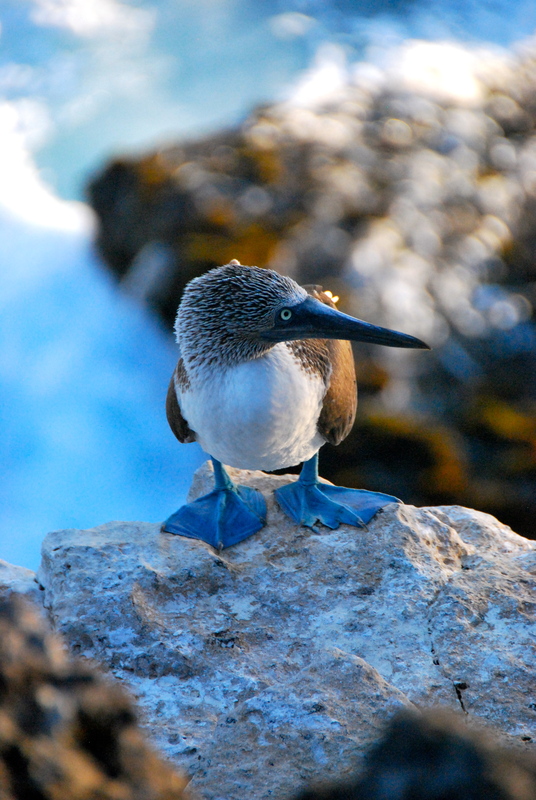 On our way back, we stumbled upon something we both wanted to see… a blue-footed booby! It was just a few feet away! That evening, as we reflected on the day’s happenings, we couldn’t believe all we had seen in our short time in the Galapagos. The next day, we joined a local guide for a tour of the highlands of the island. First, we hiked up to El Junco crater. 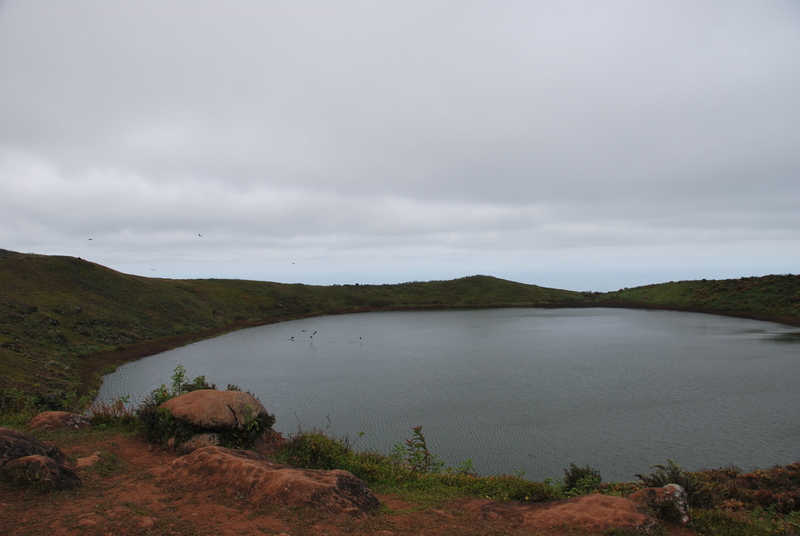 This crater is filled with fresh water and has turned into a giant bird bath for Frigate birds. These poor sea birds have no ability to get rid of salt water on their own, so they must find fresh water to bathe in. 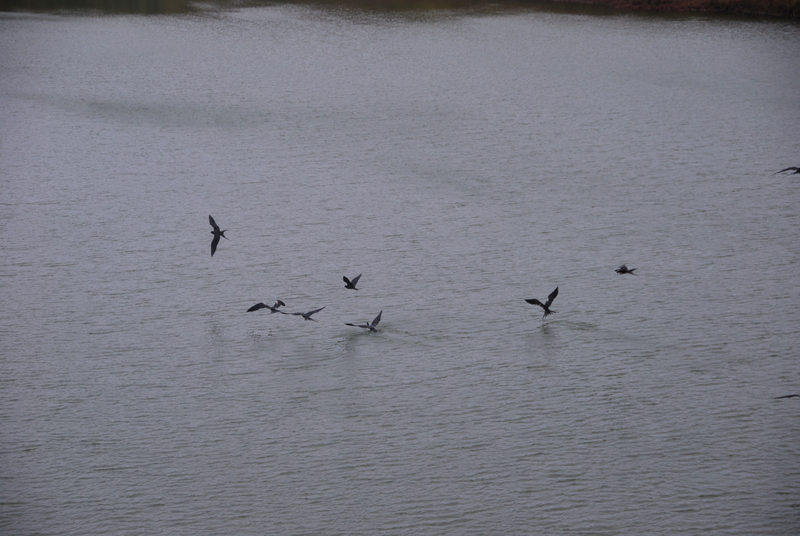 It was interesting to watch these guys dive in the water, flutter around and then take off again. They would then find a good thermal and do a little shimmy to get their feathers nice and dry. 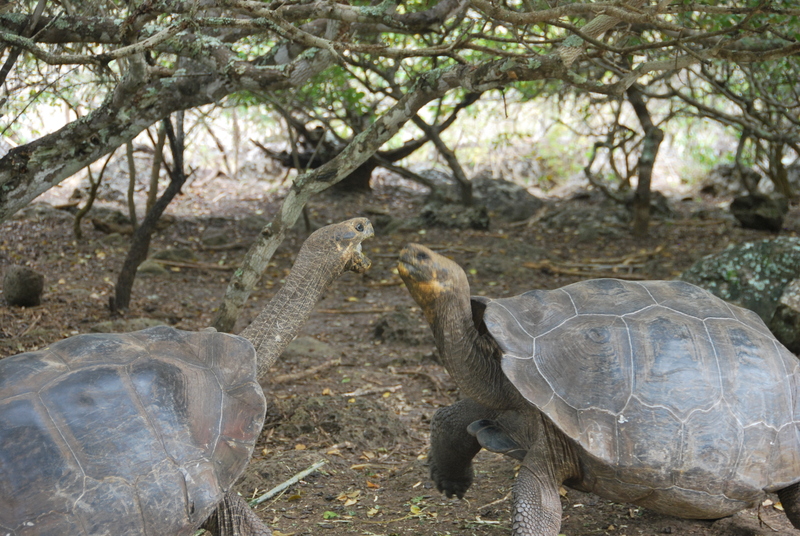 Continuing on our tour, we went to a breeding center for giant Galapagos Tortoises. They considered this place to be semi-wild because they give the tortoises many acres to wander around in and do what they do. The breeding center steps in after the eggs have been laid. At that point, they are collected and put in an incubator until they are hatched. 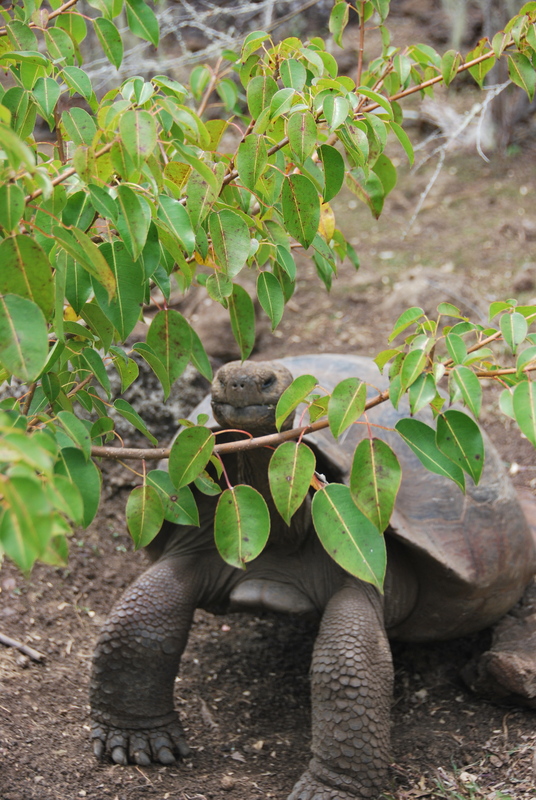 Once out and about, they monitor the tortoises’ growth for the first part of their lives. 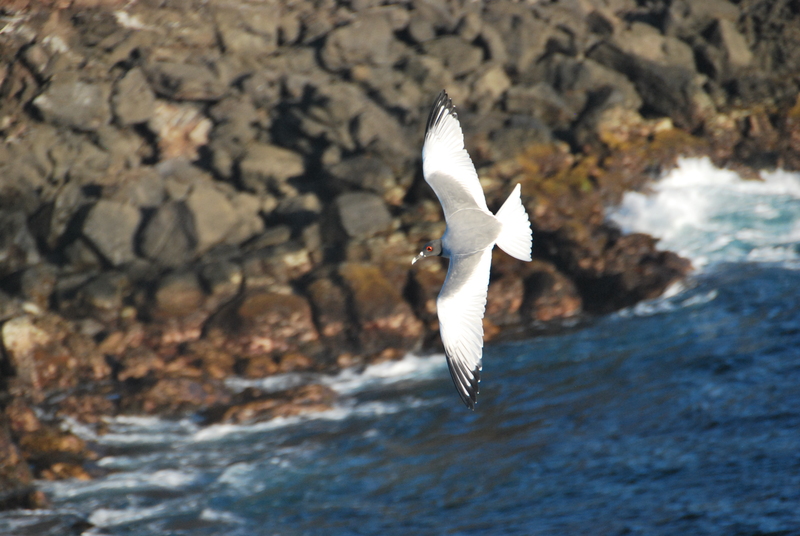 After they are no longer vulnerable to invasive species, such as rats, they are released into the wild, where they are free to slowly tour around the island. 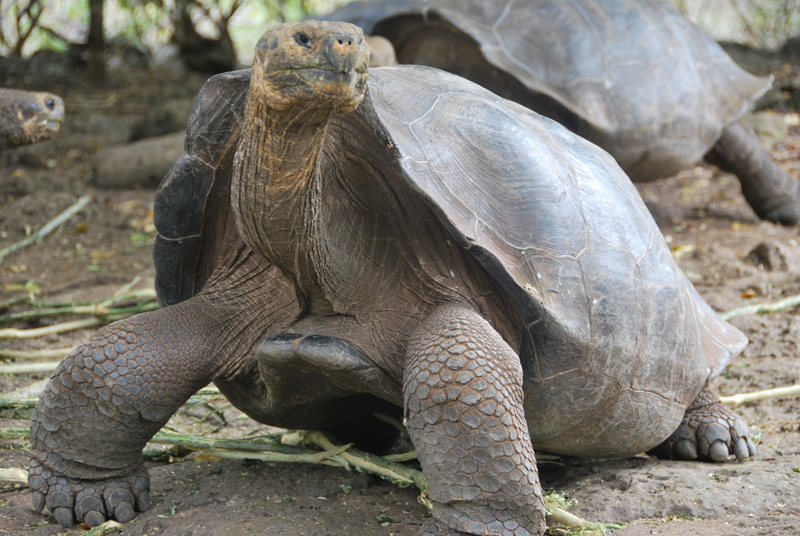 Fun facts: Galapagos Tortoises can live to be 170 years old, and don’t reach maturity until they are 25! There are different species of these tortoises found on each island. 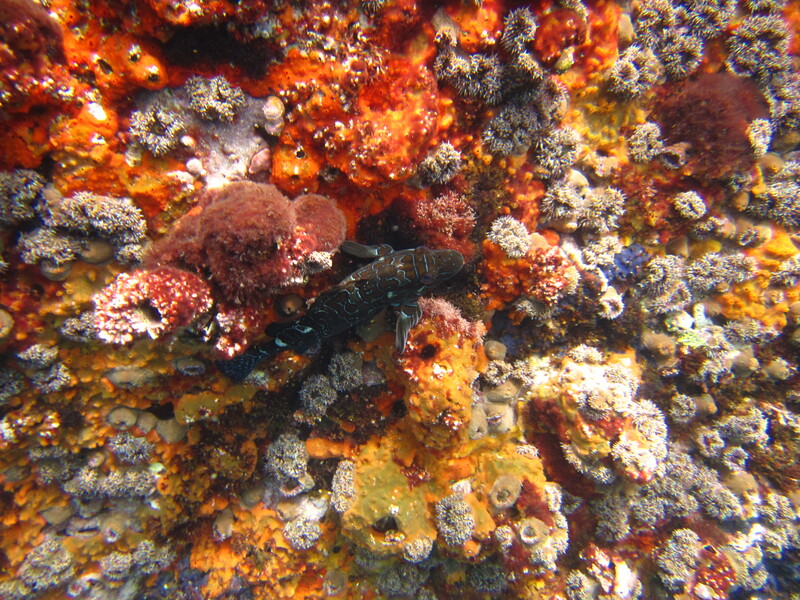 On Isabela Island, there is a different species on each of its five volcanoes! Tortoise fight!!! This doesn't last for too long... it's hard to hold up those shells! With the land tour complete, we signed up for our next adventure for the following day, snorkeling at Lobos Island and Kicker Rock. With the hope of seeing sea lions, fish, turtles, and sharks, we were almost too excited to sleep. Or it might have been the thought of SHARKS that kept us up all night. 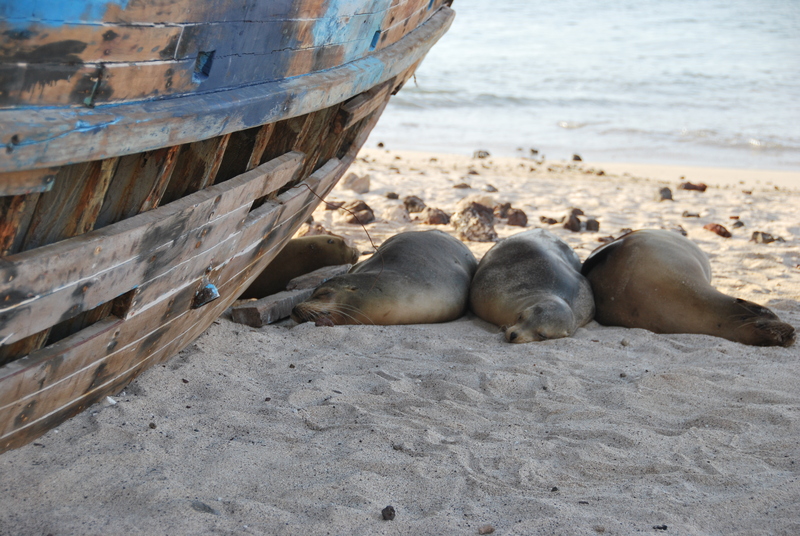 The next morning, we boarded a slightly rickety boat with seven other Jacques Cousteau wannabes, and we headed out towards Lobos Island. 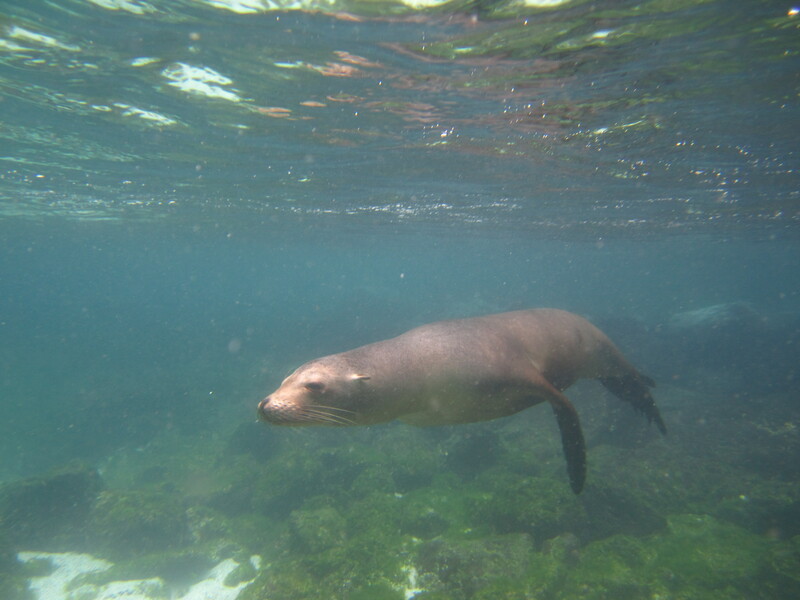 At first, we weren’t too impressed with the snorkeling, but soon the sea lions came out to play and they dazzled us with their swimming abilities. 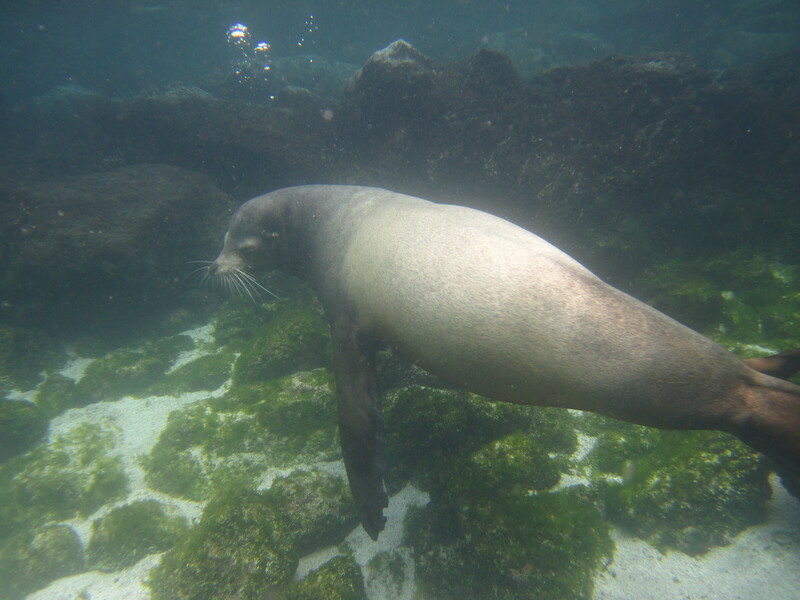 The sea lions would play “chicken” with you as they would swim right up to your mask before quickly darting out of the way. It was all fun and dandy, but when the bull sea lion went by, it much more frightening. He was big. 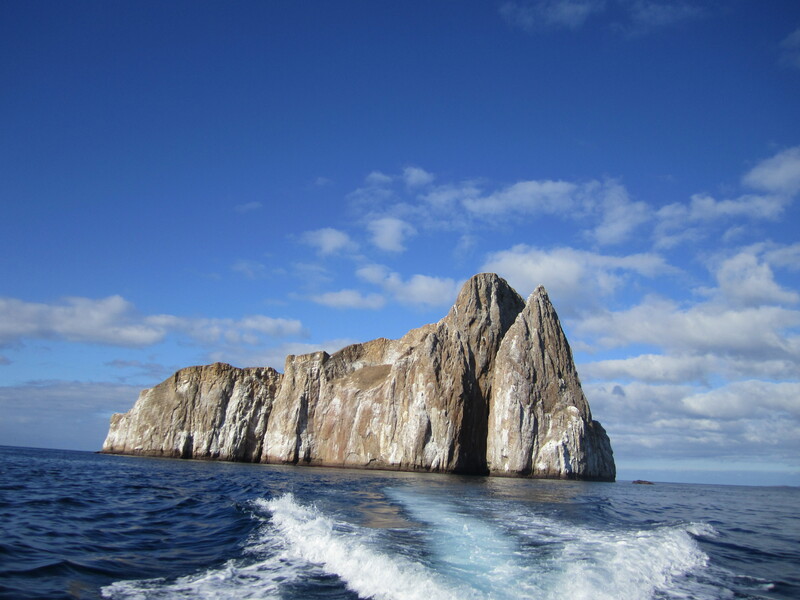 Lobos Island was just the warm up for the next big snorkel at Kicker Rock. This island juts straight out of the sea, and people say it looks like a sleeping lion. One amazing feature of this rock is a split down one side that creates a channel to swim through. Turns out, this is also where the sharks hang out. We jumped into the cold water and headed to the channel for the big show. Galapagos shark in the deep! At one point there were at least 8! 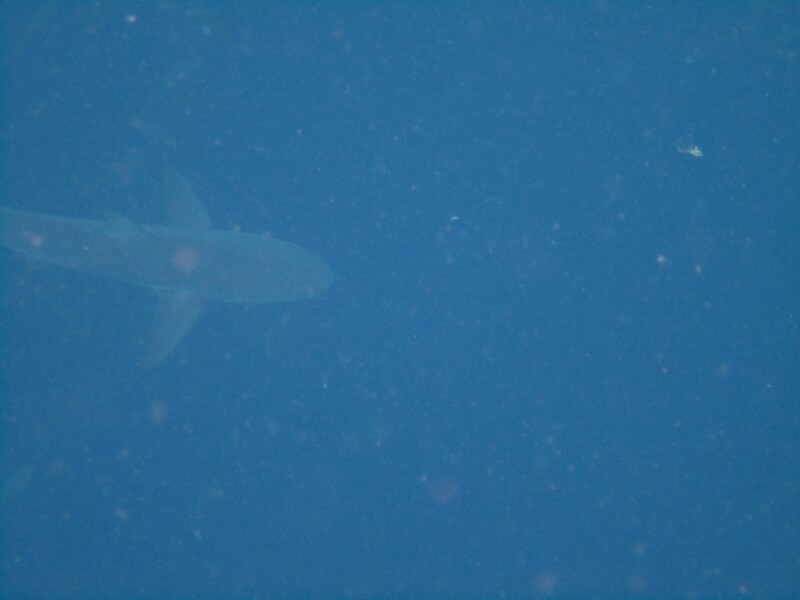 A smaller shark came to inspect us as were swimming by. Joe, being the excellent snorkeler that he is, smartly positioned his flipper between the shark and us to “protect” Kristen. What shark in their right might would try to bite through a flipper? Right? Back off Buddy... Notice his friend down below. 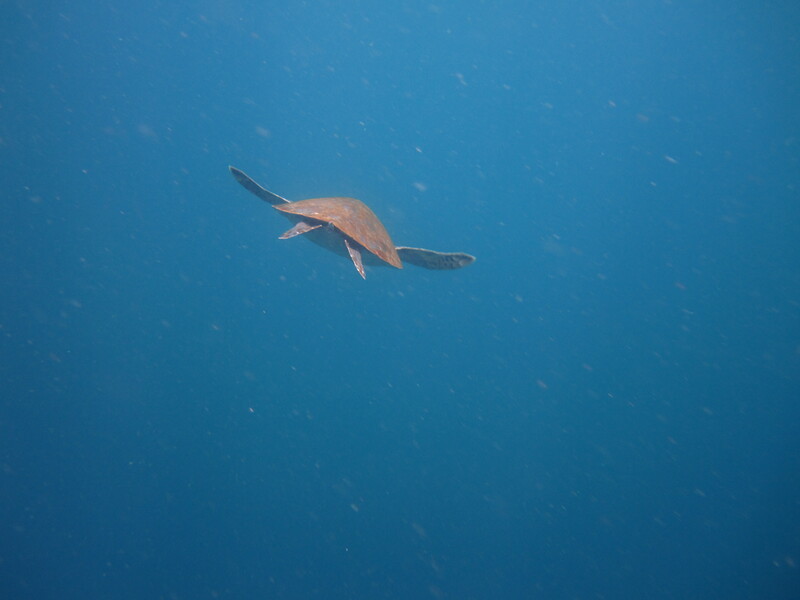 The whole time was not spent in fear because there were plenty of other smaller fish and turtles to watch swim as well. Much more fun to swim with than sharks! 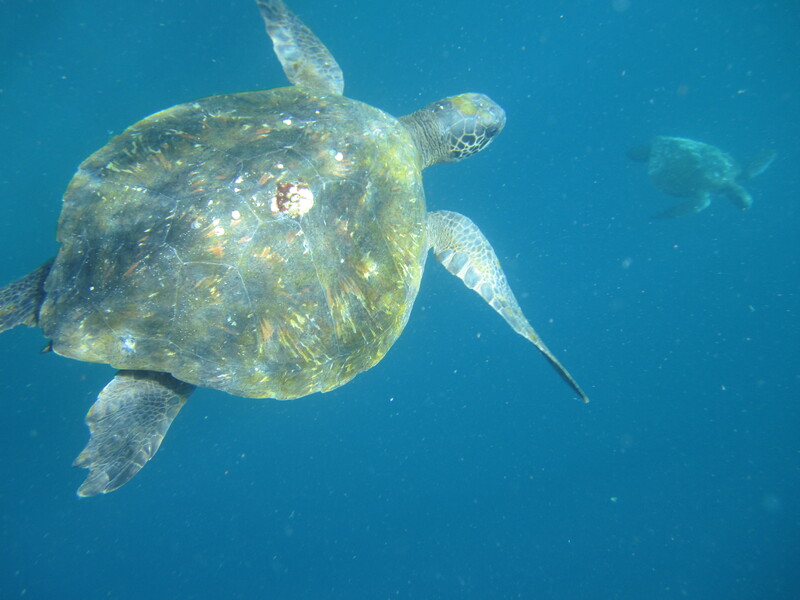 At one point while swimming around the rock, we seemed to have joined a turtle herd. We could have easily counted 15 at one time. It was awesome! 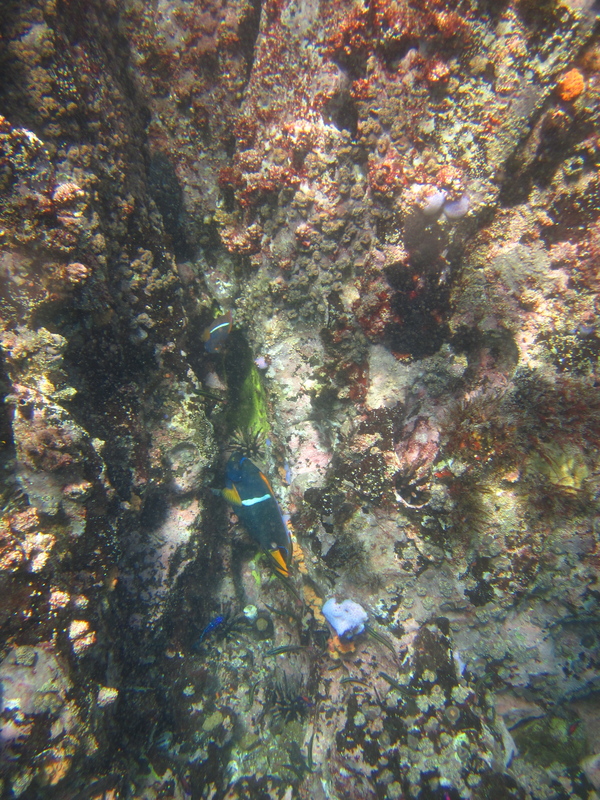 Also the coral growing from the rock was very colorful. Safely back onboard, we headed to town where we caught a beautiful sunset and enjoyed the remainder of our time on the island. 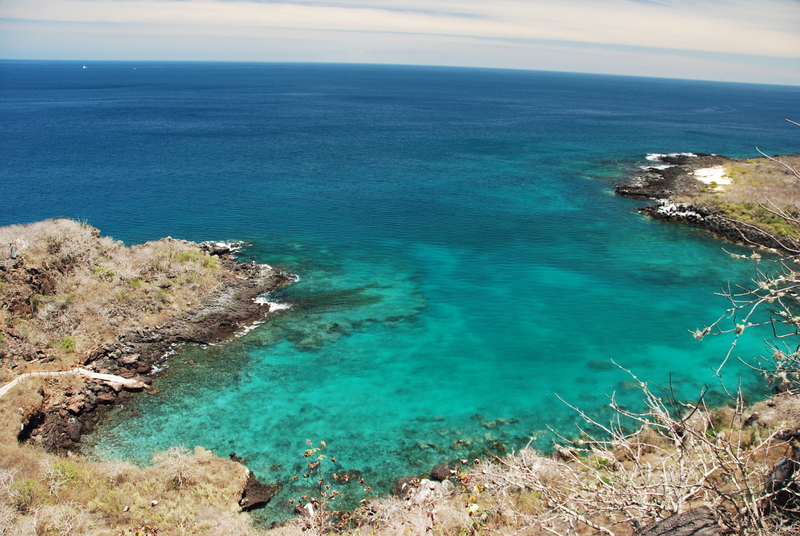 San Cristobal is truly an amazing island and we were lucky to get this opportunity to visit. 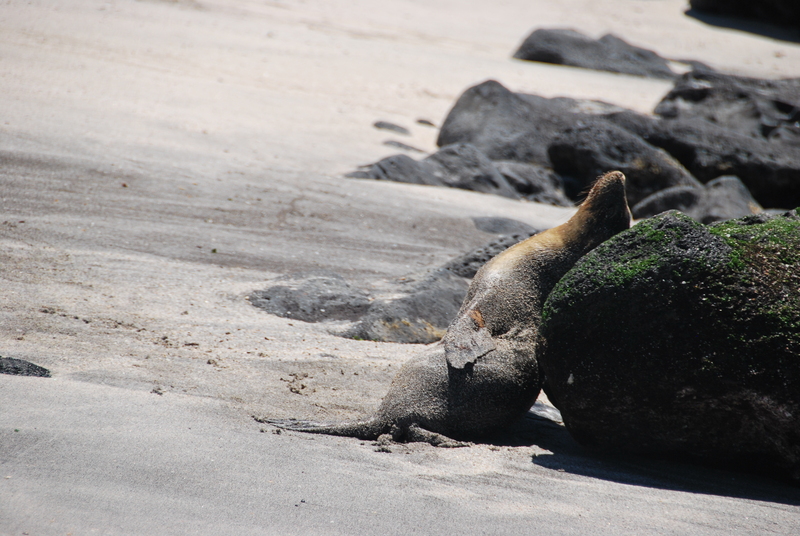 After only four days in the Galapagos, we were amazed at how much we were able to see and do on our own. Off to Isla Isabela and its sandy streets! Whoa baby. That was a good call to go there. But I’m not sure about the information you’re giving us about turtles, ’cause Sandy Plankton said they only live to be a hundred. As for the pictures, this is a time when it is justified to indulge. Driving through Ireland, taking 100s of pics of sheep: no. 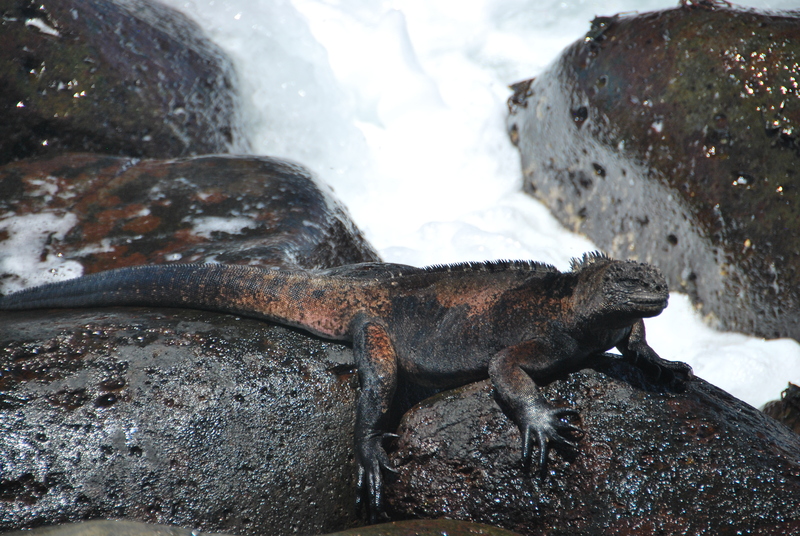 Galapagos: yes. Let me know if I need to bring you guys a few dozen more memory cards when I come. And good protection with the flipper Joe. You happen to know a shark’s true weakness: plastic and fiberglass. Tee~Love the Finding Nemo reference. Trevor was doing the same as we were looking at the pictures! Yeah– it’s all I could see! I was like, hey a Crush! And Squirt! That was it. I barely even read the post. And I’m glad I’m on the same though wavelength as your gradeschooler. Though he is exceptionally bright for a gradeschooler. I am glad you see the logic behind the flipper. There is no was possible that a shark could get confused by a black, flat, flapping object for a food source. 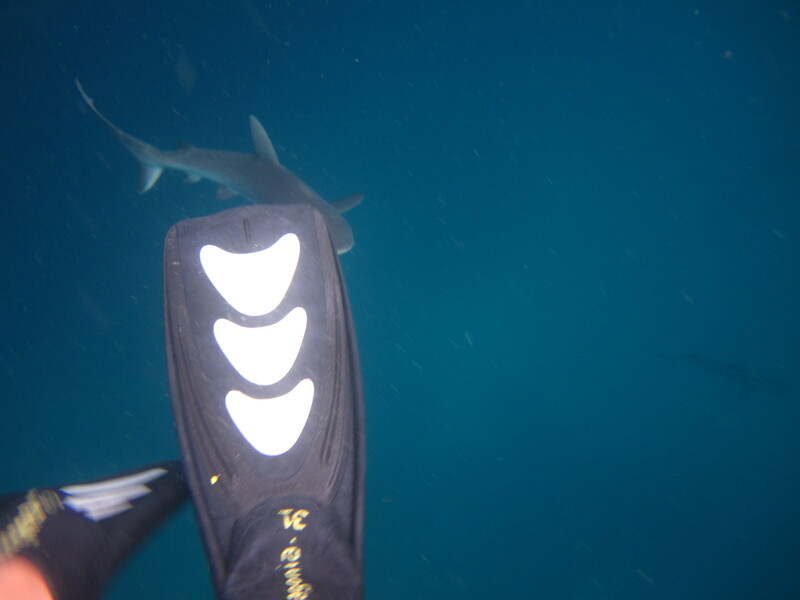 Also, don’t know if you noticed but my other flipper is a bit blurry, that is because I know sharks like a fresh breeze, so I was kicking my other foot as fast as possible because no body like an upset shark. Totally. If anything, they’d go to sleep near you out of pure relaxation from the water-breeze. What an awesome experience! Loved the pictures! WOW!!!!! Those are some of the most amazing pictures. I had to flip through the pictures several times before I could even take the time to read your commentary. Baby sea lions being born, blue footed boobies, incredible scenery, even I would love seeing all this place has to offer. (I am not sure I am now, or ever was, up to GETTING to this wonderland of nature. 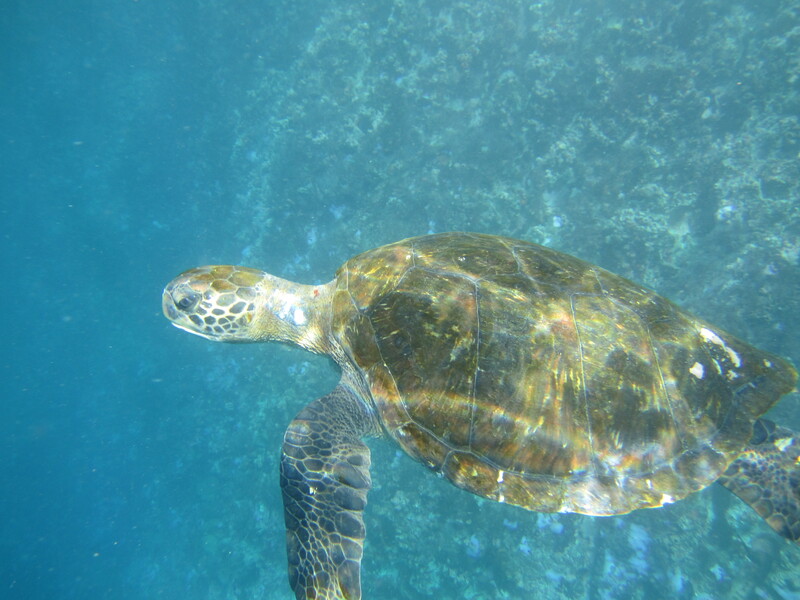 I am sure swimming with the tortoises must have been a highlight, of course you know how experienced I am from my big swim with the GIANT sea turtles at our vacation house in Maui. Seeing the pictures of sharks was more than a little unsettling, and I am hoping G’Ma doesn’t have heart attack just looking at them. I guess I am just not an ocean person. I figure the only way a shark is going to get me is if my airplane goes down in the Atlantic Ocean on the way home from Paris. Stay safe. Thanks for sharing the adventure! Love you and miss you both. Awesome pics! Looks like sooo much fun! Loving all the posts! Great pics and story. Take that, National Geographic. What an experience!